The space occupied by UPMC’s Infectious Disease Clinic in Oakland was originally conceived as the attic and storage area for the Falk Medical Building. The sloped roof structure, low ceiling heights and almost complete lack of thermal insulation created less than ideal environmental conditions for the sensitive program the clinic wanted to implement. 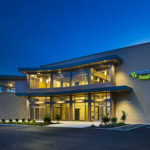 The project addressed these challenges by creating an interior insulation layer and completely replacing the air handling units serving the entire building while the rest of floors remained occupied. Logan Medical Center provides advanced outpatient services, primary care and diagnostic services to the communities in the Altoona region. The facility houses pediatric services, a family practice, an asthma and allergy clinic, ear-nose-throat, and orthopaedics specialists. 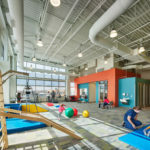 Allegheny Health Network (AHN) Pediatric Orthopaedic Institute (POI) is a cutting edge diagnostic, treatment, and rehabilitation facility divided into 3 distinct areas: clinical, physical therapy (PT) and administration. 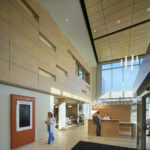 ConnectedHealth desired an interior environment to enhance health/wellness and improve connectivity between patients and staff in this holistic fitness and healthcare facility. 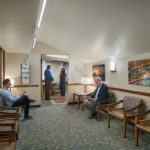 The key to this merger is a centrally located Collaboration Area that promotes engagement and interaction as patients and staff flow through this central unifying space. The Collaboration Area provides a 360 degree view of all services provided by the client.